I hope you are all enjoying the Bank Holiday Monday? Nothing like a lazy Monday! Now seems like a good time to mention that the Jo Malone Calm and Collected collaboration is now online and exclusive to Selfridges. "Inspired by the unexpected ingredients in Jo Malone London's much-loved fragrances, creative force Calm & Collected has decorated bottles, boxes and bags with playful designs." Five of Jo Malone's best selling fragrances have been given a make-over - in a dream world I would snap up the cologne gift set - link which contains all five scents but I'm hoping to splash out on the English Pear and Freesia version. You can shop the entire collective here - link. Two new OPI collections to look forward to - one collaboration is with Mustang (yeah not really sure that is a match made in heaven and Coca Cola which I believe is also to honour the world cup. 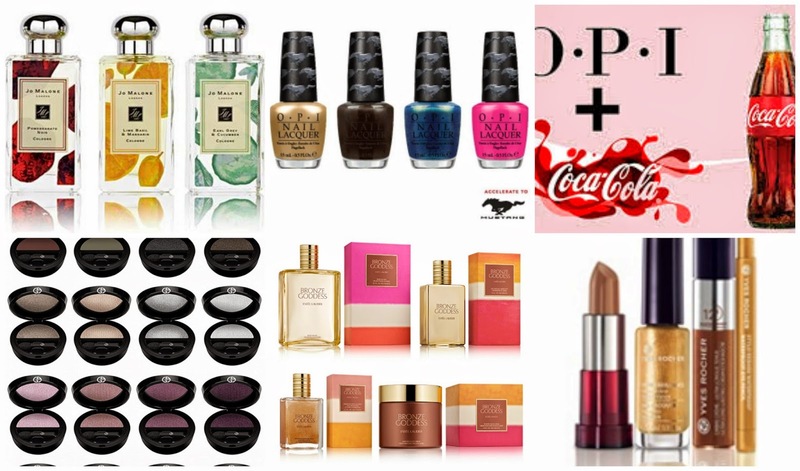 You can see swatches of the OPI Coca Cola collection here - link. "Inspired by nature’s elements, Giorgio Armani Eyes to Kill Solo Eyeshadows offers a dense and deep “Macro Color” range of 20 shades. Each colour story draws a specific vibration from a carefully studied texture. Subtle, silky, intense or sheer materials blend together to offer these single eyeshadows a distinctive luminosity and color personality. A made-to-measure approach thanks to a technological formulation that reveals all the beauty of the pigments. A palette of 20 intensely coloured eyeshadows comes in three texture families: satin, vivid and matte. The 10 satin shades, inspired by the catwalk, contain the exclusive “wet process” innovation which reduces the amount of solvents and white powder that are added to the formula. A unique method obtained by using pressure and top suction on the powder and the translucent solvents ensures the formula’s cohesion and allows a greater density of pearls to be used. The formula: a clear liquid texture is injected directly in the final pack and then dried. Once the solvent of the formula has evaporated, the texture becomes satiny soft, with enhanced colour pay-off. The colour result is spectacular and perfectly pure, offering the most beautiful hues." Yeah I didn't read all that either buy yeah for Giorgio Armani Eyes to Kill Solo Eyeshadows which you can find now via Selfridges - link. Just a friendly heads up that Estee Lauder's Bronze Goddess collection is online now as is the brands amazing new skin care line Clear Difference which is aimed at blemish prone skin -link. Yves Rocher have announced the launch of four limited edition products for summer. The collection comprises Rouge Brilliance Vegetale, a natural gloss lipstick made with cherry oil offering 12 shades inspired by nature; Golden Waterproof Eyepencil, a soft water-resistant formula enriched with chamomile extract providing intense colour; and Ultra Longlasting Cream Eyeshadow, containing a creamy and easily blended formula offering two shades. There are also a range of Nail Polishes available in four shades, as well as a Sculpting Glow Enhancer.